In this tutorial, Fab Dupont takes the parallel processing madness one notch deeper and shares his advanced parallel drum processing techniques. We strongly encourage you to watch Fab’s Parallel Compression on Drums to learn the basic principles and concepts that are referred to in this tutorial. Good morning children! Today, we're going to talk about advanced parallel drum compression. Advanced... "hou, la, la! ", as we say! We're gonna start where we left off with the regular parallel drum compression. If you remember, we had two busses : a clean bus and a crush bus and they were both fed to same drums. Here's what's different in the advanced version of that. The first step is to separate the two busses. Different sources for each one of them. So I'm gonna switch this one to something called "Drum Crush". I'm gonna send, via a Send, all the drums to that Drum Crush. So now, you have a regular mix down here that goes to the clean bus and then you have a separate mix up here that goes to my crush bus, and they're independent. You can do this in Logic, in Cubase, all the same. I'm gonna switch to this mode here, so that I can see what's going on. my regular mix down here, to the Send Boom! And now I have the exact same mix here, and here. The next step is to put everybody in Pre so that the mix up here is independent from the mix down here. The beauty now, is that I can actually change the mix of my crush bus without touching the mix of my clean bus. At this point, they're both the same because I just copied the clean mix to the crush mix but I can start making changes. Let's listen. This is my crush bus, on its own, with the current mix. Ok, that works! I think there's a little too much snare, though and I think the bass drum maybe is a little too boomy. So I'm gonna play it and adjust my mix up here to my liking. while listening to the compressor freaking out. Here we go! I think that would work. this is what happens if I switch back to my original system where both the clean and the crush bus are fed with the same signal. Now, I'm gonna switch to the new way, with a separate mix. Pay attention to the attack of the bass drum and the presence of the snare. Now, it's not as loud, but I think it's more balanced and interesting. I can raise the level a little bit to match, but that's the spirit. You have full control. You can compensate for what a compressor will do. Say, some compressors are gonna freak out on the bass drum you can send less bass drum. Say the compressors are freaking out on the overheads because there's too much cymbals, you can take the cymbals down. It requires some thinking, but it's not that hard. I think that the extra flexibility far outweighs the extra complexity. We've been doing parallel compression on the whole drum set. How about we do a little parallel compression on individual instruments? First, let's do the bass drum. bass drum parallel compression bus, just for you. You'll notice that its output is SUM, which is the clean bus. I'm also sending it to the crush bus. You don't have to send it to both, you can send it to either/or. I like to send it to both. The input is called Parallel Bass Drum. I'm going to send the inside bass drum microphone to my parallel bass drum bus. Stay with me, I'm gonna show you the signal path. And then, this crushed parallel bass drum is being sent to the SUM, and to the Crush. Simple, right? And it sounds like this. What am I trying to do here? I'm just trying to make it more dense, and more compact and get a little bit of that "mmm" thing going. then I'll have a little punch too. If I play all three bass drums together, it sounds like this. As a reminder, without the compression, it sounds like this. it's got a little more of that "poc! poc!" in the 200-300Hz, which is nice. Let's do the same thing to the snare! Here's my parallel snare drum. Parallel Snare, here you go. I make it Pre. Give it some level. Here's the snare. Here's the snare, without the compression. and also depth this way. It lengthens the tail a little bit, and it gives it a little fuzzy tone so it's not as real sounding. I like that. It's time to listen to the whole thing. First, let's listen to it raw, with no compression at all. Then, let's turn on the parallel compression bus on the whole kit with the custom mix. And then, individual parallel compression for bass drum and snare drum and see how the kit grows. listen to the sound stage and to how the drums make you feel. It's ok to close your eyes! I won't do anything funny while you have your eyes closed, it's a promise. Parallel compression on the whole kit. Bass drum, and snare drum. Going from the raw sound to the fully processed sound is a nice trip. It's like... a documentary to a movie or real versus dream. The beauty is that, since you're parallel compressing you're not ruining your transients. You have to be gentle with your transients, transients are people too. You also have to be very careful with your phase. Let's look at the situation where parallel compression can become a hindrance if you're not paying attention to phase. Check it out. If you do this a lot, you're gonna have the urge to use EQs so you can custom tailor your drum compression bus further. Why not? Since you're having a separate mix, why not a separate tone? I'm gonna add just a simple little EQ on my parallel bus. And I'm gonna listen to it raw. That sounds good, but I may have the urge, for example, to clean up the bottom. I'm known for high-passing everything, right? So what if I wanted to high-pass this? Make a nice little filter, say, 36dB/octave. Turn it on. And then, start high-passing it. It sounds good! This, for example, would be a good way to get a lot of the "poc" and push it through, and less of the "boom, boom, boom" on the parallel bus. But here's a problem. Check this out: let's turn the clean bus back on and listen to the two of them together. even though we're high-passing only the crush bus. Why is that? That's because we're using a very steep filter. And what goes on when you use a very steep filter is there's all sorts of phase shifting weirdness at the cutoff frequency. What you're hearing, is you're hearing the crush bus becoming out of phase at the cutoff frequency with the clean bus and ruining the bass on the clean bus. to change the tone of your crush bus? Well, number 1, you could use a linear phase EQ, that works. Number 2, you could choose not to, that works great, it's very fast. Number 3, you could use gentler processing which is like, say, a 6dB/octave filter, or a shelf EQ. You're still gonna have some phase shifting but not that much, you can get around it. Number 4, you could process the source tracks. If you process the source tracks then your clean bus will get affected too which is kind of a headache. That's why it's really interesting to have that separate mix for the crush bus. 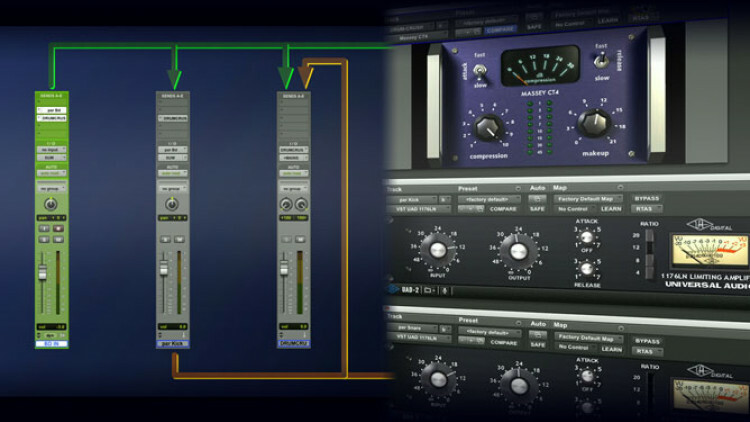 One mix for your clean bus, and one mix for your crush bus which allows you to alleviate some of the problems, change the tonal balance without having to use EQ on your parallel compression bus. I'm learning so much. Fab, you are a wonderful teacher! Thank you! Great video! Often times I'll turn my crush bus down because the kick drum blows it up, sending to the crush via a bus is brilliant! Thank you. Excellent video! The concepts were perfectly conveyed. I've been able to adapt this to a few sessions in Cubase and noticed that when combining both the clean and crush buses with the additional kick and snare compressed individually, the need to EQ individual kit pieces is greatly reduced. Thank you so much for this! It clears up all the "why is this" for me. Would love a tutorial on the differences between the Linear Phase EQ and the regular EQ in Logic, as they look the same but are named differently. I've run into quite a few compressors that have a output mix knob, including Logic's compressor. Couldn't use you use this feature in place of the more complex send routing and call it a day? Wow! Two light bulbs went off after watching this. I lost my kick drum on a mix after putting EQ on the parallel track and couldn't figure out why--now I know. And copying the main fader settings to the send faders and treating it just like another mix. It makes perfect sense, but it never clicked in my head--now I know. Thank you Mr. Fabulous!! @Karim. Yes that is what I am doing. It works. Try it. You'll see it adds a little fuzz and excitement. It does not work all the time of course. 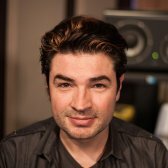 When you created the individual instrument parallel compression (let's say the bass drum one), why did you send that individual bus to the crush bus? You are parallel compressing the parallel compression? The issue with eq was good to know! Been trying to mix for years and these tutorials opened up some doors in my mind, Well Done Fab. Also love the way you present the information, clear concise and straight to the point.